Don’t regret your next quad attachment purchase. Do your research and you will see that the Wild Hare ATV Implement System is first in its class. We manufacture both front and rear quad attachments made from high strength steel that is thinner and stronger, allowing you to move more earth with less bulk. Work needs to get done. 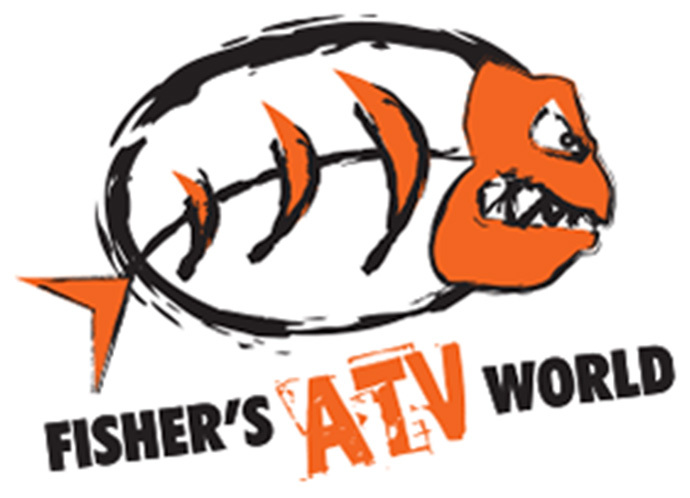 Why not make it easy with our durably constructed, high end ATV accessories? We have a variety of products which include: a Front-End Loader, a Front Pallet Fork, a Rear 3 Point Category “0” Hitch, a Rear 3 Point Cultivator, and a Rear 3 Point Disc. ATV Front-End Loader – This is more than a bucket. Our ATV hydraulically equipped Front-End Loader is the real deal. Your Loader converts your ordinary ATV to a super powered earth mover while further extending application potential and heightening performance. The Wild Hare Front End Loader requires only one initial middle mount installation which can take as little as 45 minutes. The Hydraulic Powered ATV Front End Loader includes exclusively designed suspension locks to support the added weight and prevent compression of the front springs of your ATV. The locks take seconds to install. No other modifications of the suspension are required. A simple rocker switch controls the loader arm and bucket movement and the bucket can be attached and removed in less than 1 minute. You won’t find this kind of power and versatility for an all-terrain vehicle attachment anywhere else. Front-End Pallet Forks – This product is made specifically for our Front-End Loader. Designed to help lift pallets, hay bales, large boxes, fence posts, wood piles, cargo and more with ease and control. This fork is also simple to install and remove using 3 clevis pins. Just swap out the bucket for the forks and you have the same 300 lb. lift and lower capabilities and tilt options. Rear 3 Point Category “0” Hitch – Attach the Three Point Hydraulic-Powered Rear ATV Category “0” Hitch to the back of your four wheeler and utilize a whole new set of implements. Our hitch can be connected to the same hydraulic system used for the Front-End Loader, or be used completely stand alone, depending on the hydraulic system you select. When paired with the loader, the powerful hydraulic system provides lift and lowering power to the 3 point hitch and the loader simultaneously. The only feature that is compromised is the front bucket tilt. Our 3 point hitch bolts to the ATV hitch and rear rack and is connected to the rear mounted hydraulic system. It controls the implements with a center link and two lift arms. Our modular rear attachment system is designed for ease of use, power and optimal control. Switching between the Disc and the Cultivator takes less than 2 minutes. It is powerful enough to lift the back wheels of the quad off the ground. Our reliable and practical tools will pay for themselves in no time. Our Rear Attachments and Implements fit ANY quad! Rear 3 Point Cultivator – Hook up our Rear 3 Point Cultivator to the Wild Hare hydraulic powered 3 Point Category “0” Hitch and you’ve got a 4 wheeler great for weeding, tilling, food plots, large gardens and more. The rear cultivator has a simple pin system that allows for super fast changeovers. This handy rear quad implement will save you both time and back ache. Rear 3 Point Disc – Attach the Rear Disc Implement on the Wild Hare hydraulic powered 3 Point Category “0” Hitch and bust up sod, aerate the soil, pulverize dirt chunks and level things out easier than ever before. Our disc allows for precise adjustment with the ease of an “on the fly” single finger control. The rear disc also allows for extremely fast changeovers. Smooth out any rough terrain the first time through with our durable disc implements. 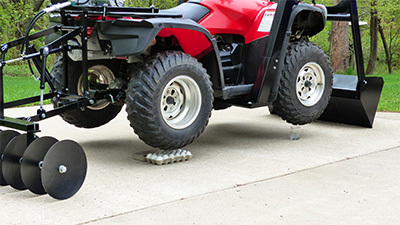 If buying a tractor is out of the question, or if you just don’t have the need for that big of a machine – our quality ATV attachments can fill in the gaps, lighten your load, squeeze in more spaces and allow you to be more efficient. There’s no need to strain yourself… it’s not about working harder, it’s about working smarter! Our products will assist you in taking the work out of your tasks and increase your time for productivity or relaxation – it’s your time, you choose what you want to do with it. Our durable front and rear quad attachments and implements will turn your quad into a helpful tool, whether you’re a groundskeeper, a landscaping contractor, snow removal contractor, stable hand, or you just want to add more function for your cabin bound or home bound four wheeler. Our ATV hydraulic accessories fit almost every make and model (see specific product pages for further details). Do so much more, with so much less. Equip your ATV’s with nothing but the best. Wild Hare Manufacturing wants you to put our products to the test; order online or contact us directly through email at info@wildharemfg.com or call 218-483-1000.